The Yomega Lightbeam Wing 2.0 Limited Edition has a light-up system identical to the Yomega Lightbeam, and a profile identical to the Yomega Saber Raider. Uses a starburst response. 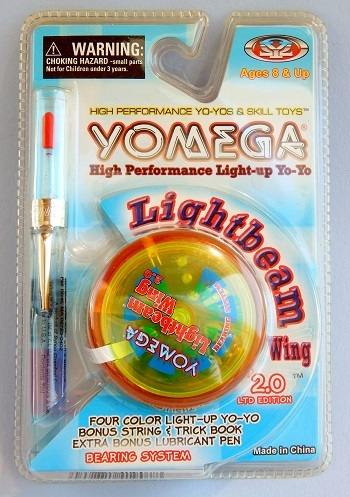 The Lightbeam Wing has 8, four-color LED lights that change color and pattern as the yo-yo spins. Came with a Yomega bearing lubrication pen and one extra string. What made this a 2.0 limited edition was the use of a size A ball bearing axle instead of a black, plastic transaxle sleeve found in the standard Lightbeam Wing. This 2.0 limited edition version is hard to find. Translucent orange body with translucent neon yellow sidecaps.